I talk to my parents everyday and each evening I look forward to asking what they’re having for dinner. It’s always something I wish I was eating too (which is half the reason I started cooking in the first place). A few weeks back, my dad told me they were having locaware. Undoubtably, a joke that only a lifelong computer industry veteran could think of – he was referring to their dinner of vegetables all grown right in their backyard garden. Local ware. I don’t know. Something about it’s catchy but if you think too hard about it, it’s not really funny or catchy sort of a geeky joke that maybe makes little sense. But my dad loves saying it, and I love hearing about their locaware so I’m going with it. Plus, this past weekend I was the beneficiary of their locaware when my mom and dad lugged along green tomatoes on a visit up North. I tell you – I come from a family that will go to great lengths to have good food and to share good food. We are not beneath shipping food to each other, packing homemade yogurt in 3 ounce size containers to get through TSA security or special ordering Indian vegetable plants from the West coast for delivery to the East coast (actually only my dad does that but we all enjoy his harvests so we no longer roll our eyes at the absurdity of his conquests). It was a toss up trying to decide what to do with my prized possession of green tomatoes. Green tomato bhaji (tempura) and a fried green tomato sandwich were high on the list. In the end, I decided to make Green Tomato Kootu, or a Green Tomato Lentil Stew. My mom makes this kootu for us whenever we go home, sometimes substituting chayote squash or eggplant for the green tomatoes. Kootu is a term for a semi-solid, stewlike dish of vegetables and lentils. And this kootu is a hearty, nutty stew, mildly spiced with a smooth consistency marked by crunchy tidbits of chana daal (dried split chick peas) and melt in your mouth vegetables. This mildly spiced lentil stew is a good pairing for tangy, tart green tomatoes. There are a lot of tasty variations though using different vegetables. Try substituting chayote squash, eggplants or a mix of carrots and bellpeppers in this lentil stew. A dollop of yogurt tops this off with a creamy flavor which balances against the spices and sourness of the tomatoes. *You can substitute sambar powder in place of these ingredients and skip step 3 below. **I find the tamarind paste unnecessary with green tomatoes but it adds a needed sour kick when using other vegetables. 1. Pressure cook or boil the toor daal until its soft. Whisk with a spoon to a smooth consistency. 2. In a deep wide skillet, heat some oil on medium heat. Add mustard seeds and cook for 2-3 minutes until they start popping (careful, they sputter). Add the green tomatoes and about half a cup of water and cooked partially covered for about 15-20 minutes until the tomatoes start to look soft. 3. Grind the channa daal, urad daal, red chili peppers and coriander seeds in a blender or food processor until ground to small pieces (do not add water). 4. Add this mixture to the green tomatoes and continue cooking. 5. Stir in the boiled toor daal and mix well. 6. Salt to taste. Continue cooking for another 8-10 minutes and serve hot with basmati rice or rotis and yogurt. 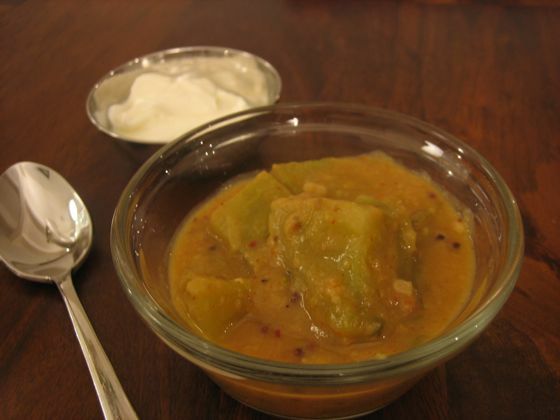 I love green tomatoes, my mom makes similar stew with tur daal, delicious! How much water should be used to boil the toor dal? I’m guessing 3-5 cups, or, maybe you get to choose depending on how thick you want it to be? just made this! awesome!! i needed to make something with all our green tomatoes and it came out great! i used about 6 tomatoes and 2 eggplant and added a bit of cream at the end. thank you! !